“The Art Walk includes music, jewelry, performances, and artwork by some of Austin’s most gifted artists. Visual artist include: Subliminal Phoenix and the 8d Crew; Performance art includes Baruzuland Shadow Puppet Theater; Creative workshops for kids are offered by Future Craft Collective and Greater Austin Garbage Arts (GAGA).” – The event is FREE. Organizers encourage Austinites to save some cash and ozone by biking, busing or walking to this event. G.A.G.A., located at 2214 S. 1st, offers free secured bike parking and discount cards for South 1st Street businesses. Non-perishable items and cash donation will be collected for the Capitol Area Food Bank. For every dollar donated, the Food Bank can provide five meals to a hungry child, adult, or senior. There at lunchtime were law-enforcement people, large workplace parties, and family groups. Iced tea was constantly replenished. There were three enchiladas on the plate, not the scanty two that seem to be ever more common around town. The rice was Spanish; the beans were smokey. Lots of people had ordered those giant bowls of homemade chicken soup. In the bowls were always at least two big pieces of chicken, usually legs, along with plenty of carrots and potatoes, and rice on the side to be added at will. I forgot to ask the guacamole fans how they liked the version here. I know that the person who ordered a chile relleno with cheese was very happy with it. The acoustic accompaniment was human conversation; somewhere in the background, there was recorded banda music occasionally audible. I don’t find a Web site for El Jacalito. It has been there for years in a little strip mall on Oltorf just east of IH-35. I think that over time it has expanded its physical quarters. There has always been music on the weekends. El Jacalito is spotlessly clean. Every surface that can possible shine or gleam does so, right down to the floors. Breakfast is served, from very large plates all the way to every possible combination of breakfast taco. Takeout business seems to be brisk. There’s a bar, but at lunchtime the worker bees order nothing from it. I like it that empty Corona six-pack cartons hold the salt, pepper, and sugar on each table. El Jacalito is located at 2030 East Oltorf Street (suite 110, telephone 445-4109). Sometime today my pre-ordered Unforseen DVD should show-up via UPS Ground. According to Laura at Two Birds Film, they had contractual AND technical issues both conspired to hold the release back until September 30th. By coincidence, this Thursday, October 2nd, Alamo Drafthouse will be holding a showing at Barton Springs itself and presented by The City of Austin and The Austin Film Society.. The pool will be “closed” from 7pm to 10pm, and during that time normal BS charges will apply for entry to watch the film(thats $3 to you and me). I can’t wait to see it again, but have plans for Thursday and Friday, so I guess it will have to wait for the weekend! The story headline for the feature on the front page of the arts section in today’s NYT is “Hitting the Rader: A Festival Soars in Texas,” byline Nate Chinen. It’s possible that this is a first-time visit to Austin for the author. His verdict? In brief, it’s that, “judging by the strength of the music, the smoothness of operations and the fervor of crowds averaging 65,000 daily — [the ACL fest] deserves recognition as a first-tier rock fest, with a regional twist.” Cons mentioned are sound bleed between the stages, heat, and dust. Heat? This weather was practically arctic, compared to what we’ve endured thus summer! The pros, according to the reporter, are many. He seems to especially like all the must Austin-specific features. There was barely any music to be heard away from the festival site; when there was, it was full-spectrum sound, not just bass only, and it was always dampened within five minutes. This is different from other years, so there was not much in the way of free music outside a very small radius. It also seemed as though there were fewer out-of-town attendees. In saying this, I’m going only by the few requests for directions and sightings of perplexed map-reviewers. There was little evidence of touring neighborhoods in rental cars, but there were more people out on scooters and bikes. Either there was less beer-drinking, more care taken about containers leaving the park, a more sober crowd, or one composed of anti-litter activists. There was no beverage trash in any nearby gutters on any of the following mornings, including this one. One significant effect beyond the pay-to-go-in area was that dust was carried quite far by any prevailing breezes, and there’s been much sneezing to be heard. And something that has never happened before is that the aroma of cooking food and the scent of smoke covered a widespread area on Friday and Saturday nights and, minus the smell of food, well on into the early morning. It reminded me of the old days, when there were active railroad sidings downtown and when one of Austin’s largest hobo camps was along the river, concentrated near where the physical plant of the local daily covers all that once was wild. Right along by Duplex Sign, at the southeast end of the Congress bridge, on a cold morning the rising auras of woodsmoke, coffee, bacon, and chile would greet the pedestrian heading downtown to work. 2-sealed water bottles, WTF! I for one had planned to use one of those 1-quart refillable bottles with a clip and attach to my belt loop and refill as needed. I’d even frozen two in advance. When I leave, the empty bottle leaves with me. Hopefully the above won’t be enforced. What was your experience? Several of the bands in town this week for the annual Austin City Limits music festival are also taping episodes of the show. Erykah Badu cancelled, but Manu Chao, Drive-by Truckers, Gnarls Barkley, The Swell Season, and The Foo Fighters are all taping shows in the next week. ACL show producer Terry Lickona described the first taping last night as an unusual treat. Manu Chao rarely perform in the US and it’s even more rare for them to appear on US television. They tend to focus on Europe and South America. Manu Chao’s parents fled Franco’s regime in Spain and settled in France where he was born, so many of his songs are in Spanish or French. He was a founding member of the early 90s band, Mano Negra. Like that band, his current work has reggae and ska influences along with a decent helping of latin music & rhythms and punk rock. Their most recent album, La Radiolina, was released last year. Many of his lyrics are political. I’m pretty sure I heard a few references to a certain controlled substance, not surprising given the reggae influence. He was interviewed by High Times last year around the time that La Radiolina was released. They’re a high energy band and will do well on a festival stage. The normally subdued ACL taping crowd took a little prodding to get going. Last night’s band included 6 musicians in addition to Chao himself: a drummer, a percussionist, a trumpet player, a keyboardist, a bassist and a guitarist. They wore their influences on their shirts. The percussionist was wearing a Tuff Gong shirt and the bass player, looked like a massive soccer hooligan, was wearing a Bad Brains shirt. They all made an effort to pump up the crowd and got people clapping and shouting throughout the set. They stuck to mostly up tempo numbers and didn’t really pause much between songs. Several of the tracks on La Radiolina include a siren sound repeated throughout. I thought it was overused and, honestly, after several songs, they kind of started to sound the same. A sampling of their recordings while writing this reveals more diversity. I’d chalk some of that impression up to my unfamiliarity with the material. I’d definitely check them out for at least half of their set. I’m glad to see the show is still making an effort to introduce its audience to artists they may not have seen before in addition to pulling in more mainstream acts like Foo Fighters. 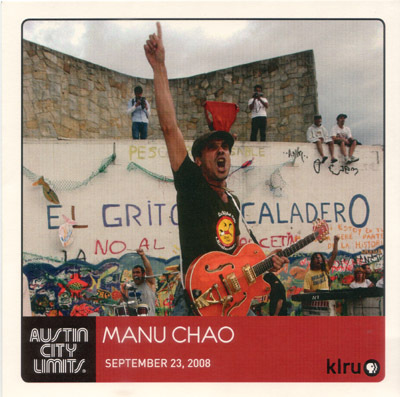 Manu Chao is the Friday night headliner at ACL Festival, starting at 8:30pm on the AT&T stage. Those dining at Eastside Cafe should never overlook Pitchforks & Tablespoons, the little shop on the grounds, and a tour of the garden is always inspiring, too. Today, one of the owners was busy at work there, we saw as we left. We were replete with a fine meal, served so expeditiously that there would have been time for dessert, but also so generous in portion that there was no room for it. The Eastside Cafe has been an Austin treasure for some twenty years, now. I was an early customer and then somehow got out of the habit. Pitchforks & Tablespoons has remained a regular stop, especially since it’s now the only place in town to buy some of the specialty dressings that some find so addicting. I think I’ve been trying the wrong days. If there’s a line, I don’t wait. Today, there wasn’t one, so now I’m going to try Tuesdays often. There were three soup specials, a blue-plate special, and other tempting items not on the printed luncheon menu. The ruby trout and the salmon entrees came hot to the table and in generous portions, with just the right amount of delicious sauce. The person who ordered the shrimp dish can’t imagine ever ordering anything else. The green salad was very large, with a classic mustard vinaigrette. The tiny corn muffins were light and not at all sweet. My vegetable was broccoli, green and not undercooked. Lemon wedges were in generous supply. Everything we saw being ordered by anybody looked delicious. The little Craftsman bungalow is as it ever was, very homelike and very conducive to lively conversation. I’ve made a personal pledge never to let so long an interval pass between meals at Eastside. Here’s the news on the fabulous pies of the Frisco Shop, made by the same pastry experts who produce those divine biscuits: call ahead, and do it the day before, ideally at least 24 hours before. The number is 459-6279. This morning at 9:30, the day’s pies were still in the oven. We were sad not to take away a pie (any of the varieties would have done very nicely, thank you), but were delighted to take away two heavenly biscuits, and very happy to see how busy the Frisco is. Many of the patrons were resplendent in burnt orange. Since we were in the neighborhood and had some time to spare, we checked out Discount Electronics for the very first time, seeking some speakers for a laptop in order to improve the sound experience for a presentation before a good-sized audience. All appears to be well organized and properly labeled. I thought that the prices were good. My fellow-seeker found an elusive item today. The two guys there were very patient with and very helpful to some far-from-young female computer neophytes. One of the staff members had a tip new to me that solved a problem that’s been perplexing me for a long time. In keeping with the general air of tidiness, this place, incidentally, has very clean restrooms. When I was busy replacing desktop innards piece by piece, I used to frequent another establishment. In the future, my first stop will be Discount Electronics. 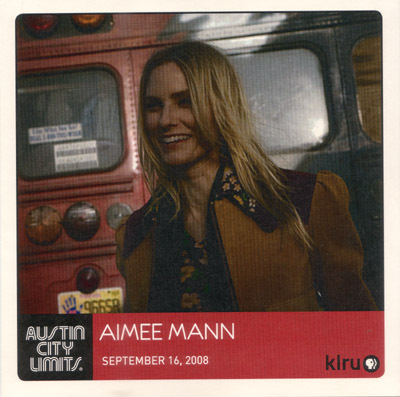 I attended an Austin City Limits taping Tuesday night with Aimee Mann. All of us old-timers remember her as the lead singer for ‘Til Tuesday in the 80s. I, like a lot of people, became a big fan after the work that she did for the Magnolia soundtrack. Coincidentally, I happened to catch her acting turn as the female nihilist in Big Lebowski over the weekend on cable, but I digress. She recently released a new album, @#%&*! Smilers, and played several tracks from it. Paul Bryan, who produced, also played bass and sang backup. In addition to Bryan, she had two keyboard players and a drummer. The guy on stage left who played piano and Hammond was wearing a Mean Eyed Cat t-shirt. I’m not sure how many if any of the backing band were local. There’s a heavy amount of keyboards and synthesizers in the new album and in the numbers she chose for the show. She had an acoustic guitar throughout the performance. She seemed a bit stiff at the beginning and mentioned this after the first few songs. She was a bit freaked out by the cameras and said she felt that she had so much makeup on that if she moved her face, it would crack. She picked up on Terry Lickona’s pre-show comments to try to only get up to use the restroom in between songs. He asked that if you have to “let it go”, please do it then. She made several jokes throughout the night about that. She also felt she botched “Going Through the Motions”, a song from her concept album The Forgotten Arm, and said she was glad they wouldn’t use all of the songs. I’m assuming we won’t see that one in the final version next month when it airs. Farther into the set, she told a story about being asked to write a song for an early scene in Shrek 3 and after being asked to revise it several times, including being asked to make it more like Fall Out Boy, the song was ultimately rejected and she brought it back its original form and completely changed the lyrics. It became “Borrowed Time” on the new album. She also mentioned before “Red Vines” that it’s about Magnolia director Paul Thomas Anderson. The original set list only showed two encores. I think they added “Calling It Quits” at the last minute. I enjoyed the performance and they definitely loosened up later in the set. Look for it to air in October. Also, check out Austin Kleon’s artistic take on the taping.